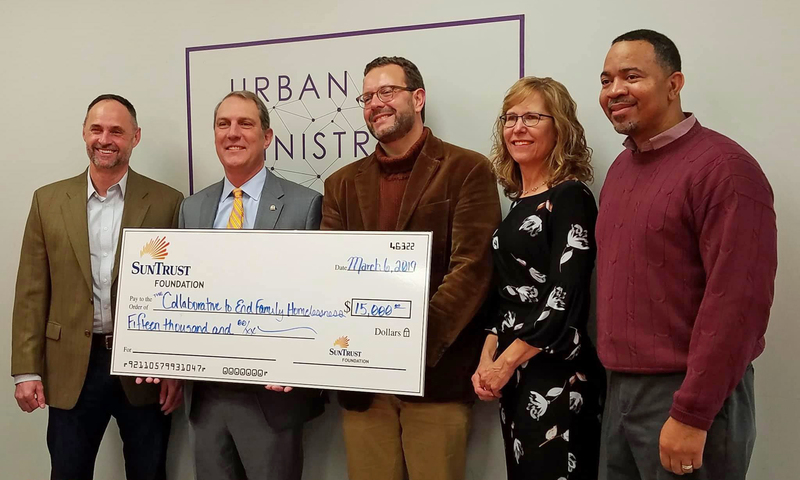 The Partnership, along with members of The Durham Collaborative to End Family Homelessness (DCEFH), received a $15,000 grant from the SunTrust Foundation, presented by Chris Bell, Sun Trust’s Regional President, and Autrice Campbell Long, Community Development Manager. DCEFH is made up of 4 Durham non-profits: Urban Ministries of Durham, Families Moving Forward, Housing for New Hope, and the Partnership. Since 2015, DCEFH has worked together to provide a multi-generational, seamless system addressing the needs of homeless families with children. In addition to housing and case management services typically offered to parents coming through the shelter system, DCEFH also provides specialized resources to counter the traumatic stress often associated with homelessness. The Partnership has several roles in the Collaborative. A portion of the Sun Trust funds will support our Touchpoints training for staff and volunteers who work directly with homeless families. The Partnership also links early childhood services like developmental screening and parent-child mental health interventions to homeless children and families, and we are navigating new data and research opportunities regarding the needs of homeless students with Durham Public Schools through the Durham Children’s Data Center. Touchpoints is a child-centered, relational approach that helps providers enter a child’s system of care in a way that empowers parents to take the lead. Service providers “come alongside” parents during the often challenging developmental milestones, called “touchpoints.” This training focuses on 5 key approaches: an evidence-based theory of child development, strengthening parent-child relationships, supporting parents, celebrating cultural differences, and building a common language of child behavior and development. Among all children, the youngest are most likely to be poor. The prevalence of poverty and homelessness is highest during the earliest, most formative years of children’s lives. Research shows poverty is a strong predictor of children’s success in school and later employment and wages. Compared to their peers, children living in poverty experience more hunger, poorer health, higher incidences of developmental delays, and learning disabilities. Many Partnership programs prioritize children experiencing homelessness: Early Head Start, NC Pre-k, Durham PreK, and other Smart Start funded programs.